Originally a settlement called Tonoloway, the area around present-day Hancock saw Europeans arriving as early as the 1730s. The great-grand uncle of future President James K. Polk had a trading post by the Potomac River near Little Tonoloway Creek, and George Washington passed through on occasion, as well as other notables. With the arrival of a toll road connected to the National Road, followed by the arrival of the Chesapeake & Ohio (C&O) Canal then the railroads, the town of Hancock boomed between the early 19th and early 20th centuries. Today it’s the perfect base for exploring a paved rail-trail and the western half of the C&O towpath. 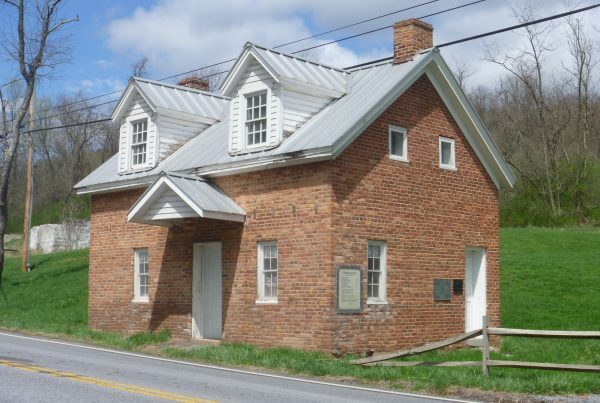 On these journeys in the Hancock area, learn about the town’s history, including the Battle of Hancock during the Civil War. 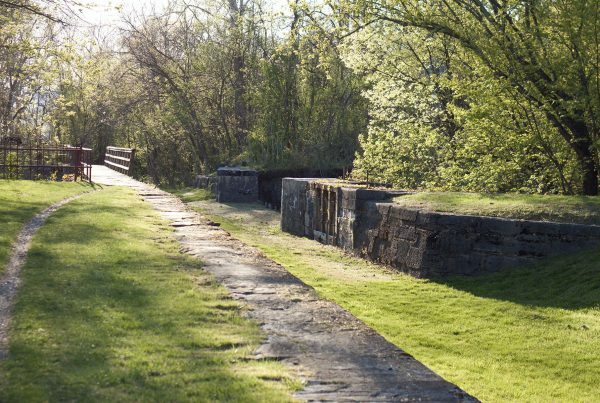 Walk or bike along the C&O Canal, an important dividing line during the war. Hancock is also the midway point for the Western Maryland Rail-Trail, and together the two trails offer a great round-trip exploration. This short-day itinerary explores Hancock’s history, including sites related to early settlement as well as the Civil War. In addition, Hancock hosts a number of events and festivals throughout the year. For more information, visit the town calendar online. Begin your explorations of Hancock at the Visitor Center and Museum, 42 West Main Street (opening times vary). The visitor center occupies the site of the old Barton House (now gone), an old stagecoach inn where once Andrew Jackson, Henry Clay, and Davy Crockett were said to have stayed. 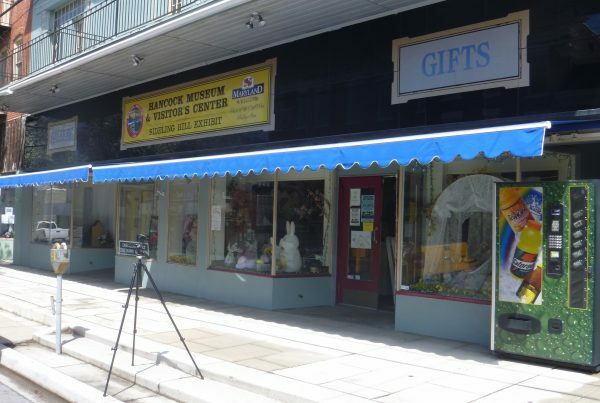 The store-front museum features a small collection of town memorabilia: news clippings of notable people and events, old photographs, and relics and antique tools. You’ll also find artifacts from the now-closed visitor center at the Sideling Hill rest area along Interstate 68/US Highway 40. Among other things, these include a menagerie of taxidermied wildlife native to the region and a collection of rocks from the unique geological formation discovered when a passage through the mountain was blasted for the road. A short video describes its significance as one of Maryland’s best exposures of rock types, structural features, and geomorphic relationships. 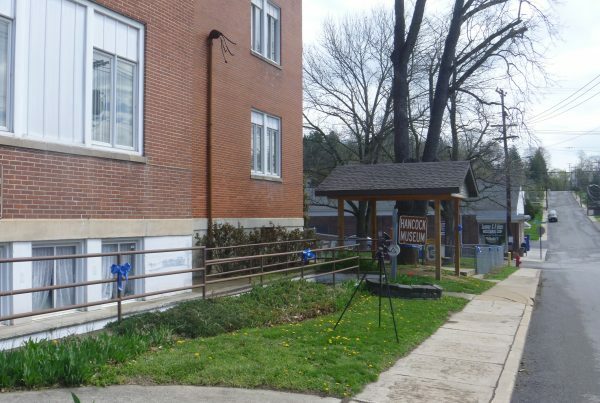 To learn more about Hancock’s history, visit the Historical Society Museum, 126 West High Street (April–Oct., 2nd and 4th Sundays, 2–4 pm, or by special appt. : 301-678-6308 ). You can walk from the visitor center by heading west two blocks on W. Main to Pennsylvania Avenue; turn north (right) then west (left) on High Street. The brick building is on the north side of the street. From the Historical Society, head east on High Street three blocks to the end, where you’ll find St. Peter’s Catholic Church and St. Thomas’ Episcopal Church. On the hill above the adjacent churches, Union troops defended the town during the short Battle of Hancock, on January 5–6, 1862. During the brief skirmish, Gen. Thomas “Stonewall” Jackson’s troops advanced on the town hoping to take control of the Potomac River and C&O Canal. The battle was the first of Jackson’s Romney Campaign and his first encounter with troops under Union Maj. Gen. Nathanial Banks. The day before the shelling began, Jackson sent his cavalry commander Turner Ashby with a truce flag to try to persuade Gen. F.W. Lander (under Banks’s command) to surrender Hancock. Lander refused. Only an estimated 75 to 100 shots were fired—the cold, wintry weather being a major factor. The Union maintained control of the town but the Episcopal church was badly damaged, as was the Presbyterian church just down the hill on Main Street. On the latter church you can see a cannonball lodged in the front of the building with an interpretive sign nearby. Built by Irish and German immigrants who had helped build the C&O Canal, St. Thomas’ served as a hospital for wounded troops for 18 months following the Battle of Hancock. Inside it boasts a Tiffany stained-glass window installed around the turn of the 20th century. If the church is locked, call in at Parish Hall next door and ask for a short church tour. Buried just behind the church is Dr. James Breathed, a major in Confederate Maj. Gen. J.E.B. Stuart’s Horse Artillery and a local town doctor. Gen. Robert E. Lee called Breathed “The hardest artillery fighter the war produced.” Learn more about him at the visitor center. From St. Thomas’ head down the hill on Church Street and cross Main Street. Head toward the C&O Canal by crossing over the Western Maryland Rail Trail and turning west (right) on Canal Street. 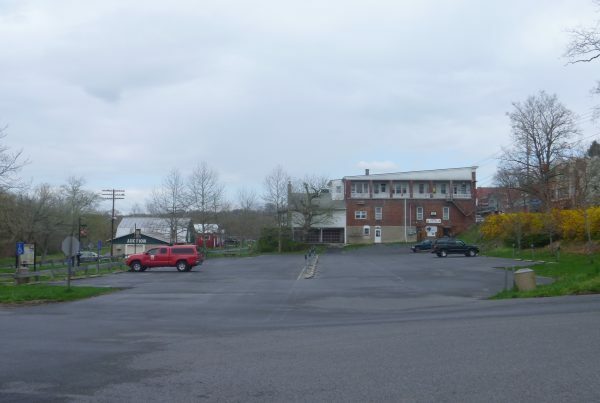 The Hancock train station once stood near where the parking lot is now. The station served both passengers and freight along the Cumberland Extension of the Western Maryland Railway, which came to Hancock in December 1904. Passenger service operated until the 1950s and freight until 1976. Sadly, the station burned in 1983. On the next block west you’ll see a large yellow house along the canal. Now extensively restored as a bed and breakfast, the old Taney building has stood at this spot since about 1878, serving as a warehouse for Mr. Taney’s whiskey (he owned a tavern on Main St.), which was transported via canal. Little Tonoloway boat ramp is just across the canal. Here you’ll find a small park under lovely shade trees with some picnic tables. 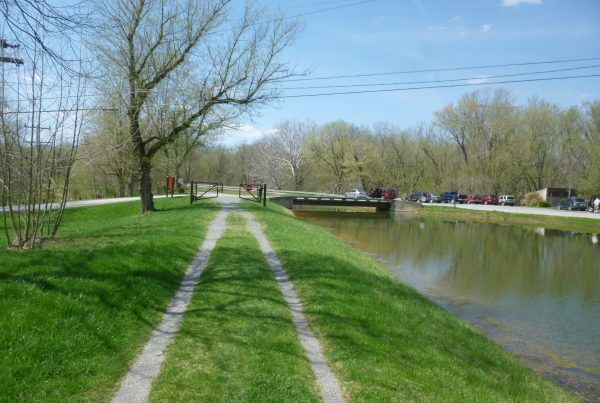 From Little Tonoloway Boat Ramp on the C&O Canal, continue your tour of the Hancock area on bike or by car to explore just a few more sites west of town. From the canal head north on Pennsylvania Avenue and turn west (left) on Main Street. The little blue house at 139 E. Main (next to the funeral home on the left) was the birthplace of Lieut. Gen. Richard K. Sutherland, who was Gen. Douglas MacArthur’s chief of staff in the Pacific during WWII. Continue west on W. Main Street and bear left at the fork, going under US Highway 522. After the viaduct the road becomes MD 144 (Western Pike), and in just under 1 mile, you’ll come to the Toll House on the right. There’s a pullout just before the little house. The Toll House is one of the last of its kind associated with the National Road. The National Road officially ran from Cumberland west to Vandalia, Illinois, and was the first major improved highway in the country. Private turnpikes, like the road from Cumberland east through Hancock, sprang up or were improved to connect the National Road with Baltimore. Up the road 0.2 mile from the Toll House, look for the white road marker noting “Old Mr. Flint’s” house (5102 Western Pike). George Washington’s family owned property in nearby Berkeley Springs, and he often visited the Hancock area. He wrote in his diary about dining with Mr. Flint. Return to Hancock via the back way by taking Locker Road, which is just across Western Pike from the Toll House. Head up the short hill into the trees and follow it to a sharp left turn on Berm Road. Before you reach Berm Road, you’ll pass through an open area that was once cultivated with fruit trees. For a century from the late 1880s, the Hancock area was a major fruit producer. Apples, pears, plums, cherries, and peaches thrived here and were shipped to canning factories across the country and even overseas. Labor issues stopped production but Hancock still maintains a few cold storage warehouses on the east end of town. Head east 2 miles back to town on Berm Road, which parallels both the C&O towpath and the Western Maryland Rail-Trail. You’ll emerge at the end of Canal Street by the C&O Bicycle shop. These itineraries, “Canal Towns: In the Shadows of the Civil War,” were developed, in part, with State Funds from the Maryland Heritage Areas Authority, an instrumentality of the State of Maryland. However, the contents and opinions do not necessarily reflect the views or policies of the Maryland Heritage Areas Authority.